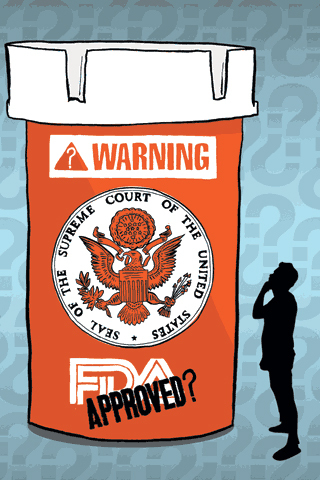 At the original trial, Levine’s lawyers argued that the drug’s label should have more forcefully warned of the heightened risk of IV push administration even though the risk of gangrene from inadvertent arterial injection was mentioned in multiple sections of Phenergan’s FDA-approved packaging. The Vermont jury sided with Levine, as did the Vermont Supreme Court, noting that FDA label approval is merely a “first step” that sets minimum safety standards. The court added that unilateral changes to drug labels are permitted under another FDA regulation “whenever the manufacturer believes it will make the product safer.” Wyeth then petitioned the U.S. Supreme Court to hear its appeal. Critics charge that a Wyeth victory would hand the industry near-blanket immunity from responsibility. “It would bar all cases related to drug defects and the manufacturer’s failure to warn,” says Christopher A. Seeger, co-lead counsel in the Vioxx litigation that obtained a $4.85 billion settlement for patients who suffered heart attacks and strokes after taking the Merck arthritis drug. Proponents of preemption, including President Bush and the FDA, counter that Congress gives the FDA the authority to regulate safety standards and drug labels. Its decisions shouldn’t be second-guessed by juries with limited scientific expertise. “The public health is not served if tort litigation has the unintended consequence of decreasing or eliminating access to a beneficial product,” explained Randall Lutter, the FDA’s deputy commissioner for policy, in a statement made during a congressional hearing held on May 14 by the House Committee on Oversight and Government Reform. In a recent preemption case involving a medical device, Riegel vs. Medtronic, Inc., the Supreme Court ruled in favor of the manufacturer, meaning such companies can no longer be sued except in extremely rare cases. Even so, opponents of preemption are optimistic that patients will prevail in the Wyeth decision. The medical device case rests on specific language that expressly preempts certain state actions. Rep. Henry A. Waxman, the California Democrat who chairs the oversight committee, says, “It appears the FDA is doing the bidding of the pharmaceutical and medical device industry at the expense of injured patients.” For decades, the FDA held that state liability cases helped the agency regulate drugs and medical devices by providing further information about their dangerous side effects. “But under the Bush Administration, [the] FDA has reversed course,” said Waxman at the May 14 hearing. Without the threat of liability, he noted, one of the most powerful incentives for safety would vanish.